The fun thing about Fan Fiction is that most everything is already decided for you. If you’re writing X-Men, then you can choose Westchester, NY, or Utopia for your setting. Harry Potter goes to school at Hogwarts. The Star Wars universe is pretty vast but there is literally an encyclopedia which will give you the rundown of every planet in the galaxy, same with Star Trek. Just because Harry Potter spends most of his time at Hogwarts doesn’t mean your story has to take place at the school. There are other locations to choose from or you can decide on something completely new (see below). The point is, figure out the best location for your story to take place, or more importantly, the best location for your plot point to take place. 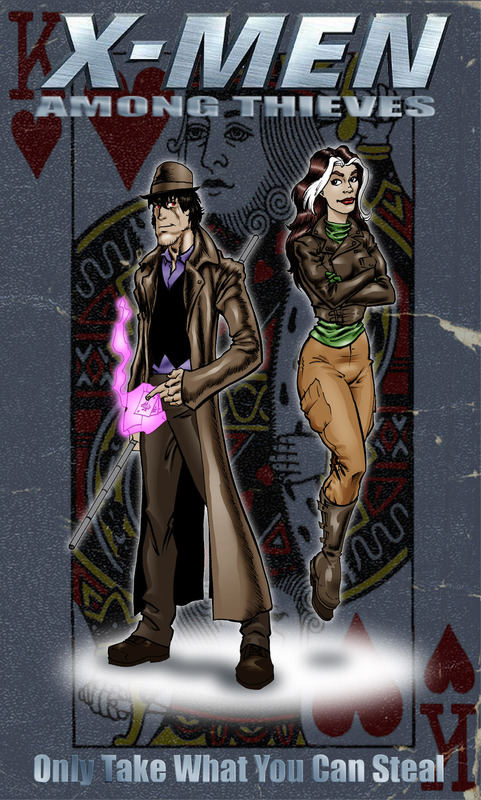 In X-Men: Among Thieves, I have two main characters, Rogue and Gambit. They have been connected to several locations, some more prominent than others. I knew that if Gambit was going to have the plot point which would be driving the story forward in real time then a good chunk of the story should take place in New Orleans because, well, Gambit… he’s not called the Ragin’ Cajun for nothing. But the two mutants have to get to New Orleans, so where do they start from? I started Gambit off in Latvia because I needed him to rob some East European guy, any East European country would have worked but Latvia has connections with the comics and Dr. Doom. I then sent Gambit to Paris because it’s Remy LeBeau… why not? I then Googled famous hotels for the drop off. England was the next stop as it was so close, really, any country could have done but I figure England would have been a good choice for a thief who is sneaking around. I Googled parks, found a location for the meet, then saw that the Crescent drive was right next to it and wrote the fight scene around that. St. Petersburg was next as I needed an old building which could possibly store Nazi artifacts underneath it and, having remembered the story of the Amber Room, I went with Catherine’s Palace. New York was a product of wanting Rogue and Gambit to steal something from Angel, though in reality I could have chosen any location as a millionaire like Angel likely has several residents, I simply chose the one most known. Japan was the second primary location, chosen because of its relationship to Rogue which allowed me to bring in Sunfire and a secondary villain. I Googled major buildings in Tokyo for the location of the fight, found they had a cool restaurant, and so wrote the Gambit meets Shingen story around that. Petra, well, it was someplace in the middle between Japan and New Orleans and I think it looks pretty cool. It was just a matter of Googling fancy hotels in Petra for the actual physical location. This is where research can come in very handy, especially when you’re dealing with universes such as X-Men and Star Wars, both of which literally have universes worth of locales and planets. And for stories that are told in ‘our world’, regardless of time, it’s great if you already have a bit of an idea of interesting facts and places that you can draw from, such as my Amber Room epiphany. If all else fails… Google and Wikipedia. So, choose the location that best suits what is happening in the story, but, again, don’t forget that there is a difference between contrived and forced. Your characters need to have legitimate reasons to be where they are and fit the character’s established characterization. You know what Hogwarts looks like. Your audience knows what Hogwarts looks like. Rowling did the work of writing it all out and the movies took care of the rest. You do not have to spend your time describing what Hogwarts looks like beyond a cursory glance of high parapets and gothic stone-masonry. Unless you want to, that is. It’s perfectly acceptable to spend just as much time in the descriptions as the original author did or to put what’s only been on the screen onto paper. Professional writers writing into an established franchise have to do this. However, do not go overboard. Remember what I said: don’t spend your opening with paragraph after paragraph explaining where you are? Same here. For big, important places like Hogwarts, your readers already know all about it and unless you have something new to add… such as perhaps the place covered in zebra stripes after something went terribly wrong… don’t spend too much time on it. Conversely, don’t spend too little either. It’s a really delicate balance but the inclusion of specific details really helps to add depth to a story and depth is the one thing no story, be it pro or fan, should ever be without. More words, yes, but not a lot of specific detail and you don’t have to actually describe the school, just invoke the images that people already have in their mind. This way you don’t actually have to fret about descriptions but you also add depth to the scene. Now, Hogwarts is something big and well seen. Regardless if you’re a fan of the books or just the movies, you know what Hogwarts looks like. Always keep in mind that when you have a franchise that crosses over between movies and books and other media that there are some things that don’t make it. Like the X-Men, fans of just the movies possibly have no idea about Utopia, the Savage Land, Murderworld, Genosha, and a host of other places that can be used. If you are wanting to put the film characters into one of these locations, keep this in mind and offer just a bit more detail than assuming everyone who reads it will already know, especially if you are posting it in the film section of someplace like FanFiction.net. This also holds true for lesser known locations. Just because you remember that one time that one character went to that one place for ten minutes… doesn’t mean everyone else will. The lesser a place is known, the more you want to spend in describing it. Also, and going back to the idea of depth, the more intimate of a place, the more description it deserves. I use intimate to mean the place where the moment is occurring. If two characters are having a discussion in the cargo hold of the Enterprise, then you want to give the scene depth by describing the hold and anything that might be in it. You don’t have to describe the whole Enterprise, but in that moment, be it an emotional discussion, or an all out fight, adding the details creates depth. Description can also be used to pace a scene, which I’ll discuss more in the pacing section, but keep in mind that if you have two characters in an emotional moment, description can be used as a veritable pause button slow the interaction and therefore draw out the angst. A place like Hogwarts or Coruscant are vast and have a lot of nooks and crannies you can take your characters, but you might want to try some new place of your own creation. When you do this, the first thing to do is research. Does this place already exist and you simply missed/forgot about it? – We have all done this. Has it already been established that such a place doesn’t exist? This is especially true for locations like ships. Be it the Enterprise, Millennium Falcon, Slave I, or Serenity, you can find blueprints for most ships on the internet and they will tell you exactly where things are located on the ship like the bathroom… if it even has one. A fellow fan fic writer recommends that you can always do things like put ‘modified’ in front of a style of ship and then do whatever you want as a way to get around the details. This can work for a general ship, such as another Galaxy Class Starship in the Star Trek universe, but for the ones that are already established and named, look up those blueprints. But as for other locations in larger settings, such as towns or whole planets, it all depends on the feel of the world as to what kind of locations exist in it. If the place does exist in your world it doesn’t mean your characters would go there. Could you see Harry and Ginny shopping at a Wal-Mart? Unless this is the actual point of the whole story… two wizards stuck navigating a muggles world… then don’t go there, it is a sure fire way to draw the reader out of the story. If a place could exist in your chosen franchise’s world, then make sure it matches the established quo. i.e. Hogwarts is not going to have a media room with actual electronics (maybe holographic magical movie screening thingy). Luke and Mara won’t have a coffee at a Starbucks, but a caf at a tapcaf. Have you ever seen the Star Trek crew go into a shopping mall outside the Promenade on DS9? Example of World Building: In Emperor’s Shadow, I created a whole planet in the Star Wars universe. I basically made the galactic equivalent of a Route 66 way-point town. I gave the planet a Star Wars sounding name of Latorin (o’s, a’s, and i’s are key). I gave it a reason for existing: as a refueling point on the Corellian Way trade route. I gave it a basic Parliamentary style government as seen on most of the Star Wars planets. I made its people basically two steps up from those on Tatooine. Everything else I made up on the go, dialing up or down from a template what already existed in the Star Wars universe. This is the biggest thing… even if you don’t explain all the history, economy, ecology, etc of your new location in your story, make sure YOU know how and why it exist. If you can’t legitimatize the place to yourself without having to literally ‘legitimatize’ it, then you can’t expect your reader to. You also never know when you can use it as a plot point or to add more depth to your story. TL;DR – Details add depth but don’t bore the reader. The lesser known the place, the more the detail. Give more care to the locations that stuff actually happens in. Make sure that any new place you create actually fits with the established universe.